1988-Present Chairman, MAA Consultants Co., Ltd.
2001-Present Chairman, ATN Properties Co., Ltd. And ATN Development Co., Ltd.
2006-2009Director of the Consulting Engineers Association of Thailand. My professional engineering experience has started since 1983 after receiving The Master’s Degree in Structural Engineering and Construction Management at Asian Institute of Technology (AIT). Extensive knowledge and well trained thoughts both theoretically and practically received from the academic program at AIT has tremendously influenced on the mindset in definite direction of growing my career path. AIT degree not only opens more doors of opportunity, but also helps to enhance continuation of professional development as well as developing mutual relation among other colleagues and friends, which will play a great role of sharing good resources in the future career. After the graduation, I started working in Engineering Consultant Companies in Singapore and Taiwan. Later in 1987, I returned back to Thailand, together with my engineering academic and professional experience I was seeking/exploring an opportunity in establishing the market of Engineering Consultant Firm in Thailand as it was set for my first goal. Later, I was able to establish an Engineering Consultant Firm company called MAA in 1988 and serving as a Chairman of MAA Consultant Company Limited in Thailand ever since. In recognition of the Degree from AIT together with the work performance, Mr.Somkuan has obtained the opportunity for very good work assignment and very exceptional fast promotion. He had worked in the very good public enterprises i.e. EGAT and PTT, and continued in the very famous private companies i.e. Team Group and CH.Karnchang Group. His works spans over 50 years using the engineering background from AIT as a core knowledge resulting in the very satisfactory and successful career. Nam Ngum 2 Power Co.
- Degree doesn’t help much but knowledge does. - High School : Trium Udomsuksa, Phyathai, Bangkok, Thailand, 1965. - BSc., Geology, Chulalongkorn University, Bangkok, Thailand, 1971. - MEng., Geotechnical Engineering, Asian Institute of Technology, Patumthani, Thailand, 1979. - 15 years in Hydropower Construction Department and 1.5 years in Corporate Planning Office, the Electricity Generating Authority of Thailand (EGAT). - 3 Years in offshore tin exploration and mining, RAT Trading & Mining (Takuapa) Co., Ltd., Takuapa, Phangnga province. - 25 years in geology and engineering consultant, GMT Corporation Ltd and Ground Data Probe Co., Ltd., Bangkok. 4.8 Hall Of Fame of the Asian Institute of Technology (AIT) on 7 September 2010 at a glittering AIT Day 2010 ceremony organized to commemorate the 51st Anniversary of the Institute. 5.1 As the Supreme Commander, General Boonsrang was the leader in taking the Oath of Allegiance of the Royal Guards to His Majesty the King in the Ceremony of Taking the Oath of Allegiance and the Ceremonial Parade of the Royal Guards to celebrate the anniversaries of the King’s Birthday twice which are the 60th Anniversary of the King’s Accession to the Throne in 2006 and the 80th Anniversary of the King’s Birthday. 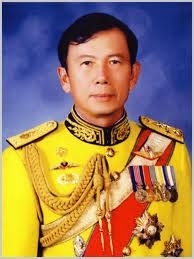 5.2 General Boonsrang was the UNTAET PKF Commander. 6.8 Other academic articles: The equation of Armed Forces Development, Militarism for Executives, Building Military Leadership Characteristics, Training at the United States Military Academy, West Point, The Equation of Life: Aroka-Parama-Lapa (Health is Wealth), Life and Decision, Enrich Meanings for Life, and Crucial military matters related to the policy level: military considerations for national security policy development, etc. In the year 1961, when I graduated MS (Hydraulics Engineering) from AIT with the highest grade, I got a scholarship from the US government to study for Ph.D. at Georgia Institute of Technology with the written purpose of the Ph.D. for me to be a computer leader in Thailand. After I earned my Ph.D. in 1964, I went to Canada to become an Assistant Professor of Mathematics at McMaster University, and then an Associate Professor in Computing Science at the University of Alberta. In 1968, I moved to the US to become Director of Graduate Studies in Computer Science at the University of Missouri in Columbia, and in 1973 at the age of 36 became a Full Professor at the State University of New York (SUNY). In 1974 I returned to Thailand to become Professor of Applied Statistics and President of the Faculty Council at the National Institute of Administration. In 1981, I was voted Asian Computer Man of the Year by Computer Asia in Hong Kong. In 1985, I became the first highest ranking Professor of Engineering in Thailand (Distinguished Professor or PC 11 which is the same rank as a Field Marshal and one rank higher than a Provincial Governor) at King Mongkut's Institute of Technology Ladkrabang. I was appointed one of the three experts in the eGovernment Committee chaired by the Prime Minister. I was named Father of the Thai Internet and Father of Thai eLearning. I was named Fellow of the Royal Institution of Great Britain, I was Chairman and owner of Internet KSC Company, the first and largest Internet Service Provider in Thailand once valued at one billion US $. I was elected one of the five Directors of Asia Pacific Network Information Center, one of the 15 members of the Board of Trustees of global Internet Society, and one of the 10 members of the Board of Trustees of IFIPS. · Founded the company in 1987 and remains the key driver in all company directions; both strategically and operationally. · Led the company transition from private company to public company, making the company the sole public company in the professional engineering consulting industry in Thailand. · Honorary Doctor of Engineering, Ramkhamheang University, Bangkok, Thailand, 2005. · Master of Engineering in Transportation Engineering, Asian Institute of Technology (AIT), Bangkok, Thailand, 1971. · Bachelor of Engineering (Honors) , Chulalongkorn University, Bangkok, Thailand, 1968. Present position/title: President and CEO at Index International Group Co., Ltd.
SET-AIT gives me transformative experiences such as world-class faculty, innovative infrastructure programs and advance engineering technology. Everything getting done here exposes me to complexity of structure, transportation, water resources and environmental projects. So, if you want to increase the level of knowledge and to grow your experience. SET-AIT may the best answer for you. Leadership is the result from the collaborative with quality classmates and advisors. Besides, I also have opportunities and be supporting from a strong alumni network. Regarded as one of the most prestigious, famous and professional consulting engineering firm in Thailand and Southeast Asia. Master planning study for regional airports system such as Chiang Mai, Chiang Rai, Phuket and Hat Yai international airport. Well-known as a successful firm providing the best varieties and qualities of engineering and architectural services to public and private sectors such as airports and aviation, bridges, expressways, highways, ports, irrigation, transits system and pipe work etc. I was lucky to be a student of AIT, a wide diversity of students and faculty members of different nationalities, which was an advantaged. I experienced specific academic trainings in the Division of Human Settlements Development both in the class rooms and undertook field research for my thesis and living in international environment settings. These experiences have greatly contributed to a success of my 27 years career with UNHCR. Master of Science (Rural Development Planning). After I graduated from Division of Human Settlements Development in August 1979, I started my career with the United Nations High Commissioner for Refugees as Field Assistant stationed in several refugee camps in Thailand, dealing with the living condition of refugees in areas of Feeding, Sanitation, Education, Health and Protection. I left UNHCR as I was granted Student Research Scholarship from the Japanese government during 1982 and 1983, When returned, I worked with the Japanese Volunteer Centre’s Slum Improvement Project in Klong Toei for one and half year then re-join UNHCR as Legal Assistant determinating the status of refugees, subsequently became Assistant Field Officer then rose to Associate Field Officer in refugee camps, Northern Thailand. In 1992 I was promoted to be International Staff, holding positions i.e. Field Officer, Repatriation Officer and Head of Field Office. During a span of 17 years international assignment, I was assigned to Bangladesh, Iran, Afghanistan, Uzbekistan, Tajikistan, Albania, Kosovo, Yugoslavia, Sudan, Iraq and back to Afghanistan again until retired in 2009. AIT degree holders are well recognized worldwide. Therefore I can further my education without any difficulty. 1972 Ph.D. (C.E. ), Northwestern University, U.S.A.